Looking back at her first summer spent working as a BC Parks student ranger, Emma McGrath has a list of projects that fill her with pride. On one occasion, McGrath and her crew hopped into a helicopter and flew to Wedgemount Lake in Garibaldi Provincial Park to spend four cloudless days rebuilding part of the trail. Another project sent the crew to Francis Point Provincial Park to rebuild a staircase that had been closed since fall. 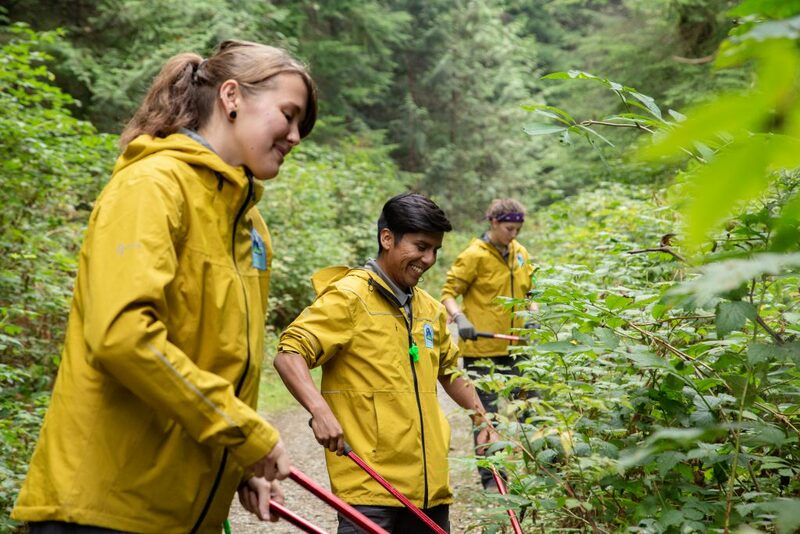 The Squamish crew is among eight teams of student rangers that spent two months working in parks in the Prince George, Smithers, Kamloops, Victoria, Black Creek, Manning Park, North Vancouver and Squamish regions. Launched in April, the Student Ranger Program provides 48 young adults with skills and knowledge that can be applied towards future employment in the fields of conservation, recreation and community engagement. Their work focuses on a variety of projects pertaining to ecosystem restoration, invasive species control, trail building and maintenance, Indigenous relations and outdoor education. Sam Holden wanted to find a summer job he was passionate about that involved being outdoors with people who share similar views about conservation. Working with his North Vancouver crew, Holden re-routed a section of trail at Cypress Provincial Park, built bridges up to Falls Lake in the Coquihalla Summit Recreation Area and conducted public outreach to numerous park visitors. One of his best memories is the crew’s first project — installing bear caches at Pinecone Burke Provincial Park. The Student Ranger Program is the first program established with proceeds generated from the sales of BC Parks specialty licence plates. Offered to young adults aged 18 to 30, the program runs from May to August. Eligible candidates must be enrolled in full-time studies in the past academic year with the intention of returning to full-time studies in the fall. For North Vancouver crew lead Cara McGuire, whose goal is to teach outdoor education to high school students, being a face for BC Parks was a magical summer experience. “You meet young kids who want to be rangers now and they see us doing it, so they think, ‘I can do that when I’m in university.’ We’re giving confidence to the younger generation that they can make a difference,” said McGuire, noting the public was often thankful to see student rangers in parks. For more about the Student Ranger program, check out the video below. For more information about the BC Parks Student Ranger Program, click here. For more information about BC Parks specialty licence plates, click here.